As the smoke clears over the Star Wars RPG campaign the crew of Steve, Justin, Julian and Erika discuss in the aftermath of this deep space horror campaign how the crossover worked, how the betrayals and how the new kids handled playing with the Terrible Warriors. Listen in as the group relaxes and enjoys dropping their characters and talking about where they’ve come and where they are going in upcoming adventures. 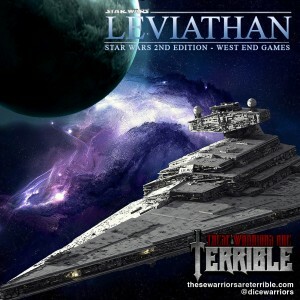 The Warriors Steve, Justin Julian and Erika have moved on in their Star Wars RPG adventure led by Birdman; having decided to forget what they did to get out of the last debacle and are now heading through deep space to determine the truth behind project Leviathan and the strange Imperial station. Once inside all they find is evidence of death and destruction as what started as a simple space adventure has now changed into something much more terrifying.